The wars that followed The Collapse nearly destroyed civilization. Now, twenty years later, the world is faced with a choice—rebuild what was or make something new. Review: I feel bad that this was a tour book, and so I had to move it to the top of my TBR pile. I'm certainly not doing it any favors reading it so soon after Blood Red Road because it's too similar, and can't possibly hope to measure up. To be completely honest, this book was... unmemorable. Already, just an hour after I've finished it, I can feel the storyline and characters seeping out of my brain. When I finished it I immediately thought "okay! What's next?" There was no reflection, no... anything. I was just done. I think one of the reasons I felt this way is because I think this book is meant for younger readers. The main characters are 15 and 16, but I could see this as being a good book for those "almost teens." Kind of upper-middle grade. And middle grade is just not my thing. Post-apocalypse and dystopia books are really blooming right now, and there are those that stand up above the rest (Blood Red Road) and there are those that fall in the cracks. This was the latter. A very simple, straight-forward story. With very simple, commonplace characters. 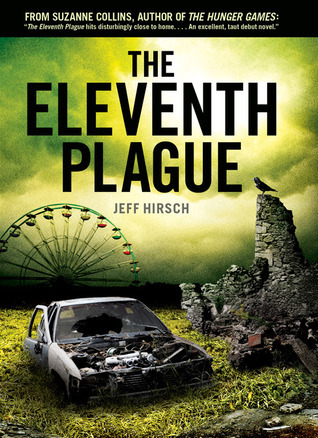 If you've got a young teen or preteen that you'd like to introduce to the post-apocalypse genre, this would be a good one for them. If you're a veteran of these kind of books and are looking for something that'll knock your socks off, I'd skip this one. Wow, okay. I really wanted to give this one a try, but because of this review, I'm probably going to put in down in the "have to buy" wishlist.